The Chancellor can only hope that his £20bn investment in the economy between now and 2010 will pay dividends. He can only hope that people will spend more as a result of the VAT reduction and the more generous tax free allowance for basic rate taxpayers. Because whatever else it does, this fiscal boost saddles the economy with extra Government borrowing just when it can least afford it. 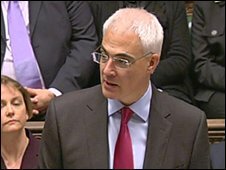 The borrowing figures, revealed by Alistair Darling, are astonishing even after all the speculation about the worsening public finances. He said the annual budget (excluding investment) would not be back in balance till 2015. And he said total Government borrowing would reach a peak of £118 billion in the financial year 2009/10 (a staggering increase from the £38bn forecast at the time of the Budget). That will be 8% of national income (GDP), the highest since modern records began in 1970. Mr Darling is running up more new borrowing than the peak seen under the Conservatives after the 1990s recession and more than under Denis Healey, Labour chancellor in the 1970s. The Chancellor said total public sector debt would rise steadily from 41% this year to a peak of 57% of national income in the 2013 financial year and that does not include any of the effects of the recent bank bailout. These figures underline the damage which will be wrought on the public finances by the impending recession. Mr Darling pointed out that corporation tax payments from financial services were likely to be down 35% this year and stamp duty from homes sales down 40%. Tax revenues boomed on the back of the financial sector bubble. They are not expected to return for some time, if ever, to the same degree. That is one explanation for why it takes so long to balance the books. The sky-high borrowing is racked up even after National Insurance increases from 2011 and a tight squeeze on spending increases. It will raise questions about why the Government did not balance the books in years of strong growth and went into a downturn with high levels of borrowing. What is in the pre-Budget report for you?